Zimbabwe’s political crisis will play out against a backdrop of substantial public trust in the army but a clear rejection of military rule in favour of democracy. 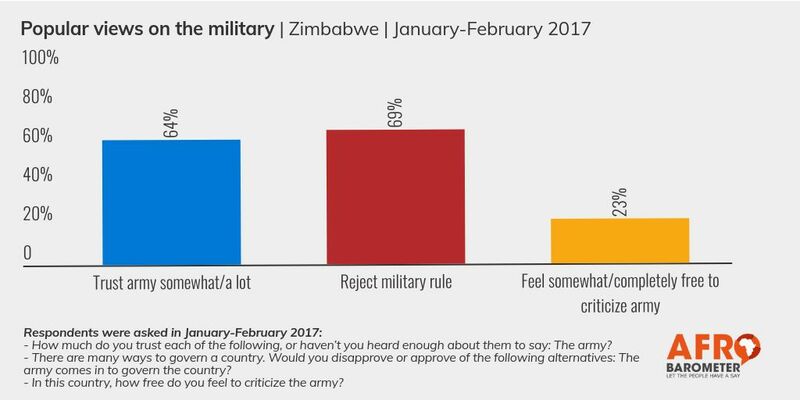 Almost two-thirds of Zimbabweans said in an Afrobarometer survey in January-February 2017 that they trust the army at least “somewhat.” But even more said they disapprove of military rule and prefer democracy over any other political system. Importantly, respondents overwhelmingly said they feel “not very free” or “not at all free” to criticize the army. Download the full press release for the key findings.